Lower demand from key buyer industries and high overcapacity has led to decreasing net profit margins for some businesses over the last two years. The Chinese machinery industry recorded a turnover increase of 7.4% in 2016, reaching CNY 24.55 trillion (EUR 3.16 trillion). 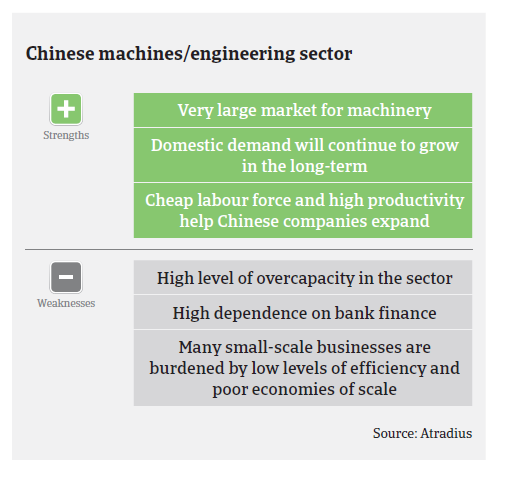 Profits of Chinese machinery businesses grew 5.5% last year, to CNY 1.68 trillion (EUR 216 billion). 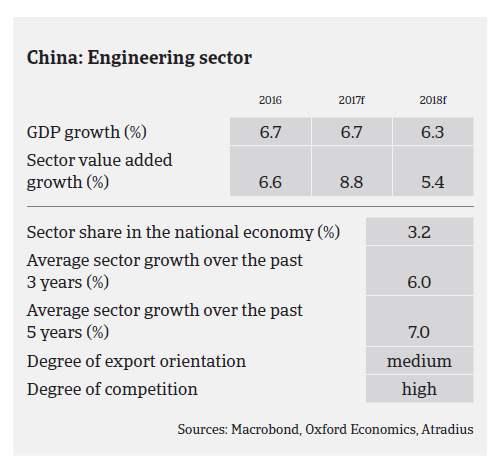 However, despite this expansion, the industry is facing some challenges; the cooling down of the Chinese economy since 2013 caused a slowdown in machinery sales growth. In particular, demand for engineering machinery, heavy machinery, mining machinery and petroleum machinery remains subdued compared to the very high growth rates seen in the years before 2013. Additionally, in 2016 growth in Chinese machinery investments slowed for the fifth consecutive year. More specifically, the growth ratio decreased to just 1.7% in 2016, 8 percentage points lower than in 2015 and 6.4 percentage points lower than the whole manufacturing sector. Foreign trade remained weak in 2016, as exports decreased 3.6% (to EUR 313.2 billion), after already declining in 2015. However, foreign trade is expected to rebound in the coming months. Lower demand from key buyer industries and high overcapacity has led to decreasing net profit margins for some businesses over the last two years. 12 out of 100 machinery companies registered losses in 2016, and total loss for these 12 companies increased 6.3% (compared with total profit growth of 5.5% for the sector). This indicates a performance gap within the industry, with healthy and profitable companies recording higher profits, while unprofitable businesses are incurring larger losses. As machinery manufacturing is a highly capital-intensive business with large investments in fixed assets, financing requirements and gearing are high in this sector. However, Chinese banks are increasingly reluctant to lend, due to a large amount of non-performing loans accumulated in recent years and because of the economic slowdown. This less favourable lending policy mainly affects privately-owned small and medium-sized businesses. If bank loans are provided, additional security is usually required, such as fixed assets and personal property guarantees. The average payment duration in the Chinese machinery industry is 90-150 days. As credit conditions have been tightened, many smaller and/or privately owned machinery businesses face liquidity issues, leading to slower payments and even payment defaults. We have observed many small machinery companies shutting down their businesses since 2014, and this trend is expected to continue. In order to optimise economies of scale, mergers and reorganisations of smaller companies have increased. In contrast to their smaller/privately owned peers, larger and state-owned machinery companies are doing better, as it is much easier for them to get financial support from a parent company or the government when in trouble. Therefore, their payment records are better and the resilience of their businesses is higher. In general, our underwriting strategy is rather restricted for smaller/privately owned businesses, while we are more open to companies with state/government or multinational group background. 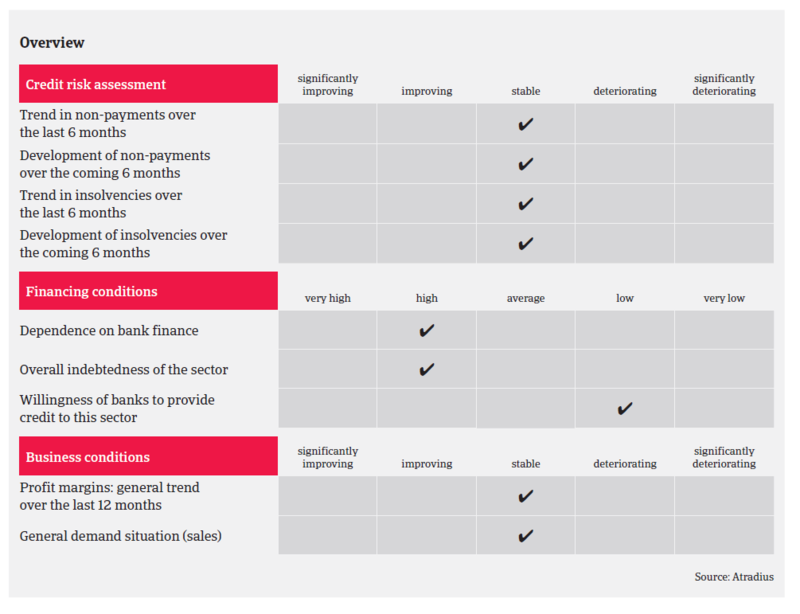 Our underwriting stance also differs according to the performance of the downstream industry, i.e. we are open for automotive-related machinery, neutral on electrical machinery, and restrictive on textile machinery and mining machinery. China’s proportion of domestic and foreign past due B2B invoices is almost in line with the regional average and has increased compared to last year. ICT sales growth is slowing down, and in some segments requests to prolong payment terms and overdue payments have increased since the end of 2015.